I’ve been planning a tablescape for my family’s Fourth of July brunch. Fourth of July is an important holiday for our family. It is a strong tradition that my dear grandfather, whom I called Bobby, instilled in us. He would always plan a barbeque with lots of fireworks. He was very patriotic and loved the Fourth of July. He has been gone for two years now, and I miss him very much, but always feel a part of him is with me especially on the Fourth. This year we will start out with a neighborhood parade. All of the kids decorate their bikes in patriotic attire and parade through the neighborhood. My two youngest will be participating this year, and it is so much fun!!! Later in the evening, we will have a barbeque and shoot off lots of fireworks. Tablescapes are one of my most favorite things to do. I have a bad addiction for dishes, and have since I was a little girl. As a child, one of my favorite gifts to receive was a set of play dishes. Unfortunately, that love of dishes did not leave as I got older. I have dishes stored everywhere!!! I hope that I have given you some ideas for your Fourth of July Celebration. Next week, I’ll be sharing two great breakfast or brunch recipes that can be prepared the day before. Beautiful table!…I so love the linens you chose….great tablecloth….source? I am sure your grandfather is looking down upon you and proud that you are carrying on his tradition. What a lovely patriotic table! I’m enjoying your blog so far… thanks for stopping by mine as I now have a new blog to follow that loves French Country!! Angelina, thanks so much for the sweet comments. Have a great weekend!!! Love your patriotic table. Smyounds like you have a fun day planned for the 4th. Thank you so much Ellis. Have a great weekend!!! I adore your Fourth of July Tablescape, dear one! The use of items with polka dots are my favorite! Thank you for carrying on a Family Tradition! Pat, thank you so kindly for the sweet comments. I hope that you have a great weekend and a Happy Fourth of July!!! An adorable tablescape. You are very talented. From the amazing plate stack to the centerpiece, I love it all. What a special touch to use the flags on the plates. Valerie, thank you so much for the kind compliments. I love dishes so much, and have fun setting my table for family and friends. I’m so glad you liked my tablescape. I hope that you have a great week and a Happy Fourth of July!!! Love the tablecloth, please share the source. I have an oval kitchen table also and have the hardest time finding linens for it unless I buy online. Happy Fourth of July!! Thank you so much Kristen! The tablecloth on my oval table is actually rectangular shaped. I had a store clerk in a linen store tell me that it would work the same as a tablecloth for an oval. It works perfect. Also, the tablecloth is a sample that I picked up. It is from France and is coated cotton which makes for easy clean up. I’ve had some for over two years, and they still look great. I’m a retailer of these tablecloths and have not set up an online store yet. You can message me through my contact page, and I would be glad to help you. Have a great day!!! Cindy thanks for the very sweet comments!!! You have made my day! I hope that you have a great weekend!!! Love your Fourth of July Tablescape…….simple, yet really festive and pretty! Thanks for sharing…. Lanita, thanks so much for the very kind comment. I hope that you have a Happy Fourth of July and a great weekend. Thanks for stopping by!!! What a festive patriotic table. 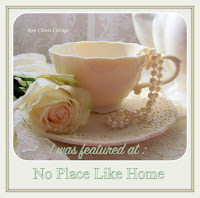 Thank you so very much for sharing this wonderful post at Thoughts of Home on Thursday. Thank you so much Laura! Have a great weekend! Love your 4th. of July table and dishes for it. Simply adorable !! The linen cloth and place mats are lovely as the dishes are, specially the cute polka dot mugs and plates. I too adore dishes. Fabby, thanks for the kind comments. I hope that you have a great week!!! Rhonda, thank you so kindly for the sweet comments. I think that is so neat that you have the same white milk glass bowl. Mine is very special to me, and it is one of my most prized possessions. It belonged to my “Me-Me.” She was my grandmother on my father’s side. It used to sit on her dining room table holding fruit. One day, when I was newly married, she brought it to me. Now, it sits on my table holding fruit,and it always reminds me of her.